A dental restoration or dental filling is a treatment to restore the function, integrity, and morphology of missing tooth structure resulting from caries or external trauma as well as to the replacement of such structure supported by dental implants. They are of two broad types—direct and indirect—and are further classified by location and size. A root canal filling, for example, is a restorative technique used to fill the space where the dental pulp normally resides. Tooth #3, the upper right first molar, with the beginning of an MO preparation. Looking into the preparation, the white, outer enamel appears intact, while the yellow, underlying dentin appears recessed. This is because the dentin was decayed and was thus removed. 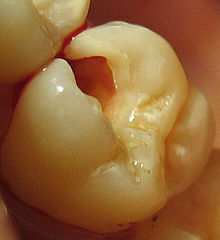 This portion of the enamel is now unsupported, and should be removed to prevent future fracture. The process of preparation usually involves cutting the tooth with a rotary dental handpiece and dental burrs to make space for the planned restorative materials and to remove any dental decay or portions of the tooth that are structurally unsound. If permanent restoration cannot be carried out immediately after tooth preparation, temporary restoration may be performed. The prepared tooth, ready for placement of restorative materials, is generally called a tooth preparation. Materials used may be gold, amalgam, dental composites, glass ionomer cement, or porcelain, among others. Preparations may be intracoronal or extracoronal. Intracoronal preparations are those which serve to hold restorative material within the confines of the structure of the crown of a tooth. Examples include all classes of cavity preparations for composite or amalgam as well as those for gold and porcelain inlays. Intracoronal preparations are also made as female recipients to receive the male components of Removable partial dentures. Extracoronal preparations provide a core or base upon which restorative material will be placed to bring the tooth back into a functional and aesthetic structure. Examples include crowns and onlays, as well as veneers. In preparing a tooth for a restoration, a number of considerations will determine the type and extent of the preparation. The most important factor to consider is decay. For the most part, the extent of the decay will define the extent of the preparation, and in turn, the subsequent method and appropriate materials for restoration. Another consideration is unsupported tooth structure. When preparing the tooth to receive a restoration, unsupported enamel is removed to allow for a more predictable restoration. While enamel is the hardest substance in the human body, it is particularly brittle, and unsupported enamel fractures easily. This technique involves placing a soft or malleable filling into the prepared tooth and building up the tooth. The material is then set hard and the tooth is restored. The advantage of direct restorations is that they usually set quickly and can be placed in a single procedure. The dentist has a variety of different filling options to choose from. A decision is usually made based on the location and severity of the associated cavity. Since the material is required to set while in contact with the tooth, limited energy (heat) is passed to the tooth from the setting process. In this technique the restoration is fabricated outside of the mouth using the dental impressions of the prepared tooth. Common indirect restorations include inlays and onlays, crowns, bridges, and veneers. Usually a dental technician fabricates the indirect restoration from records the dentist has provided. The finished restoration is usually bonded permanently with a dental cement. It is often done in two separate visits to the dentist. Common indirect restorations are done using gold or ceramics. While the indirect restoration is being prepared, a provisory/temporary restoration is sometimes used to cover the prepared tooth to help maintain the surrounding dental tissues. Removable dental prostheses (mainly dentures) are sometimes considered a form of indirect dental restoration, as they are made to replace missing teeth. There are numerous types of precision attachments (also known as combined restorations) to aid removable prosthetic attachment to teeth, including magnets, clips, hooks, and implants which may themselves be seen as a form of dental restoration. Class I Caries affecting pit and fissure, on occlusal, buccal, and lingual surfaces of molars and premolars, and palatal of maxillary incisors. Class II Caries affecting proximal surfaces of molars and premolars. Class III Caries affecting proximal surfaces of centrals, laterals, and cuspids. Class IV Caries affecting proximal including incisal edges of anterior teeth. Class V Caries affecting gingival 1/3 of facial or lingual surfaces of anterior or posterior teeth. Class VI Caries affecting cusp tips of molars, premolars, and cuspids. Mount classified cavities depending on their site and size. The proposed classification was designed to simplify the identification of lesions and to define their complexity as they enlarge. These casting alloys are mostly used for making crowns, bridges and dentures. Titanium, usually commercially pure but sometimes a 90% alloy, is used as the anchor for dental implants as it is biocompatible and can integrate into bone. The composition of alloy powder is controlled by the ISO Standard for dental amalgam alloy in order to control properties, such as corrosion and setting expansion. Dental amalgam is widely used because of the ease of fabricating the plastic material into rigid direct fillings, completed in single appointment, with acceptable strength, hardness, corrosion, and toxicity properties. It is more forgiving of preparation and technique than composite resins used for that purpose. High copper dental amalgam is preferred over conventional dental amalgam as it has better corrosion resistance and less susceptible to creep. Amalgam is now mainly used for posterior teeth. Although the mercury in cured amalgam is not available as free mercury, concern of its toxicity has existed since the invention of amalgam as a dental material. It is banned or restricted in Norway, Sweden and Finland. See Dental Amalgam Controversy. Although rarely used, due to expense and specialized training requirements, gold foil can be used for direct dental restorations. Dental composites, also called "white fillings", are a group of restorative materials used in dentistry. Crowns and in-lays can be made in the laboratory from dental composites. These materials are similar to those used in direct fillings and are tooth-colored. Their strength and durability is not as high as porcelain or metal restorations and they are more prone to wear and discolouration. As with other composite materials, a dental composite typically consists of a resin-based matrix, which contains a modified methacrylate or acrylate. Two examples of such commonly used monomers include bisphenol A-glycidyl methacrylate (BISMA) and urethane dimethacrylate (UDMA), together with tri-ethylene glycol dimethacrylate (TEGMA). TEGMA is a comonomer which can be used to control viscosity, as Bis GMA is a big molecule with high viscosity, for easier clinical handling. Inorganic filler such as silica, quartz or glasses, are added to reduce polymerization shrinkage by occupying volume and to confirm radio-opacity of products due to translucency in property, which can be helpful in diagnosis of dental caries around dental restoration. The filler particles give the composites wear resistance as well. Compositions vary widely, with proprietary mixes of resins forming the matrix, as well as engineered filler glasses and glass ceramics. A coupling agent such as silane is used to enhance the bond between resin matrix and filler particles. An initiator package begins the polymerization reaction of the resins when external energy (light/heat, etc.) is applied. For example, camphorquinone can be excited by visible blue light with critical wavelength of 460-480 nm to yield necessary free radicals to start the process. After tooth preparation, a thin primer or bonding agent is used. Modern photo-polymerised composites are applied and cured in relatively thin layers as determined by their opacity. After some curing, the final surface will be shaped and polished. A glass ionomer cement (GIC) is one of a class of materials commonly used in dentistry as filling materials and luting cements. These materials are based on the reaction of silicate glass powder and polyalkenoic acid. These tooth-coloured materials were introduced in 1972 for use as restorative materials for anterior teeth (particularly for eroded areas, Class III and V cavities). As they bond chemically to dental hard tissues and release fluoride for a relatively long period, modern-day applications of GICs have expanded. The desirable properties of glass ionomer cements make them useful materials in the restoration of carious lesions in low-stress areas such as smooth-surface and small anterior proximal cavities in primary teeth. Results from clinical studies also support the use of conventional glass ionomer restorations in primary molars. They need not be put in layer by layer, like in composite fillings. Full-porcelain dental materials include dental porcelain (porcelain meaning a high-firing-temperature ceramic), other ceramics, sintered-glass materials, and glass-ceramics as indirect fillings and crowns or metal-free "jacket crowns". They are also used as inlays, onlays, and aesthetic veneers. A veneer is a very thin shell of porcelain that can replace or cover part of the enamel of the tooth. Full-porcelain restorations are particularly desirable because their color and translucency mimic natural tooth enamel. Another type is known as porcelain-fused-to-metal, which is used to provide strength to a crown or bridge. These restorations are very strong, durable and resistant to wear, because the combination of porcelain and metal creates a stronger restoration than porcelain used alone. One of the advantages of computerized dentistry (CAD/CAM technologies) involves the use of machinable ceramics which are sold in a partially sintered, machinable state that is fired again after machining to form a hard ceramic. Some of the materials used are glass-bonded porcelain (Viablock), lithium disilicate glass-ceramic (a ceramic crystallizing from a glass by special heat treatment), and phase stabilized zirconia (zirconium dioxide, ZrO2). Previous attempts to utilize high-performance ceramics such as zirconium-oxide were thwarted by the fact that this material could not be processed using the traditional methods used in dentistry. Because of its high strength and comparatively much higher fracture toughness, sintered zirconium oxide can be used in posterior crowns and bridges, implant abutments, and root dowel pins. Lithium disilicate (used in the latest Chairside Economical Restoration of Esthetic Ceramics CEREC product) also has the fracture resistance needed for use on molars. Some all-ceramic restorations, such as porcelain-fused-to-alumina set the standard for high aesthetics in dentistry because they are strong and their color and translucency mimic natural tooth enamel. Not as aesthetic as porcelain-fused-to-ceramic, many dentists will not use new machine-made "monolithic" zirconia and lithium disilicate crowns on anterior (front) teeth. Cast metals and porcelain-on-metal are currently the standard material for crowns and bridges. The demand for full ceramic solutions, however, continues to grow. Composites and Amalgam are used mainly for direct restoration. Composites can be made of color matching the tooth, and the surface can be polished after the filling procedure has been completed. Amalgam fillings expand with age, possibly cracking the tooth and requiring repair and filling replacement. But chance of leakage of filling is less. Composite fillings shrink with age and may pull away from the tooth allowing leakage. If leakage is not noticed early, recurrent decay may occur. A 2003 study showed that fillings have a finite lifespan: an average of 12.8 years for amalgam and 7.8 years for composite resins. Fillings fail because of changes in the filling, tooth or the bond between them. Secondary cavity formation can also affect the structural integrity the original filling. Fillings are recommended for small to medium-sized restorations. Inlays and onlays are more expensive indirect restoration alternative to direct fillings. They are supposed to be more durable, but long-term studies did not always detect a significantly lower failure rate of ceramic or composite  inlays compared to composite direct fillings. Porcelain, cobalt-chrome, and gold are used for indirect restorations like crowns and partial coverage crowns (onlays). Traditional porcelains are brittle and are not always recommended for molar restorations. Some hard porcelains cause excessive wear on opposing teeth. The US National Institute of Dental Research and international organizations as well as commercial suppliers conduct research on new materials. In 2010, researchers reported that they were able to stimulate mineralization of an enamel-like layer of fluorapatite in vivo. Filling material that is compatible with pulp tissue has been developed; it could be used where previously a root canal or extraction was required, according to 2016 reports. When a deep cavity had been filled, there is a possibility that the nerve may have been irritated. This either results in short term sensitivity to cold and hot substances, and pain when biting down on the specific tooth. It may settle down on its own. If not, then alternative treatment such as root canal treatment may be considered to resolve the pain while keeping the tooth. In situations where a relatively larger amount of tooth structure has been lost or replaced with a filling material, the overall strength of the tooth may be affected. This significantly increases the risk of the tooth fracturing off in the future when excess force is placed on the tooth, such as trauma or grinding teeth at night, leading to cracked tooth syndrome. ^ "Your Teeth and Cavities". WebMD. Retrieved 2017-05-04. ^ TCT magazine, "WorkNC Dental at the "CAD/CAM and Rapid Prototyping in Dental Technology" conference"
^ "G. V. Black Classification of Carious Lesions". ^ Mount, Graham J.; Bds, W. Rory Hume (1998). "A new cavity classification". Australian Dental Journal. 43 (3): 153–159. doi:10.1111/j.1834-7819.1998.tb00156.x. ISSN 1834-7819. ^ F.Mccabe, John; W.G. Walls, Angus (2008). Applied Dental Materials. Blackwell Publishing Ltd. p. 182. ISBN 9781405139618. ^ Dorfman J, The Center for Special Dentistry. ^ F.McCabe, John; W.G.Walls, Angus (2008). Applied Dental Materials. Blackwell Publishing Ltd. pp. 197–198. ISBN 9781405139618. ^ Christian F.J. Stappert, Wael Att, Thomas Gerds, and Joerg R. Strub Fracture resistance of different partial-coverage ceramic molar restorations: An in vitro investigation J Am Dent Assoc 2006 137: 514-522. ^ "Where and When Is It Appropriate to Place Monolithic vs. Layered Restorations," Inside Dentistry, August 2012, Vol. 8, Issue 8, E. McLaren, R. Margeas, N. Fahl. ^ Van Nieuwenhuysen JP, D'Hoore W, Carvalho J, Qvist V (2003). "Long-term evaluation of extensive restorations in permanent teeth". Journal of Dentistry. 31 (6): 395–405. doi:10.1016/s0300-5712(03)00084-8. PMID 12878022. ^ Composite resin fillings and inlays. An 11-year evaluation. ; U Pallesen, V Qvist; (2003) Clin Oral Invest 7:71–79 doi:10.1007/s00784-003-0201-z Conclusion:.." Considering the more invasive cavity preparation and the higher cost of restorations made by the inlay technique, this study indicates that resin fillings in most cases should be preferred over resin inlays." ^ Guentsch et al. (2010). Biomimetic Mineralization: Effects on Human Enamel In Vivo. Advanced Engineering Materials. ^ "Fillings that heal your teeth – how regenerative medicine could change your visit to the dentist - The University of Nottingham". www.nottingham.ac.uk. This page was last edited on 7 February 2019, at 04:09 (UTC).